Just before 15-20 minutes YouTube users faced “500 Internal Server Error” while accessing the website. 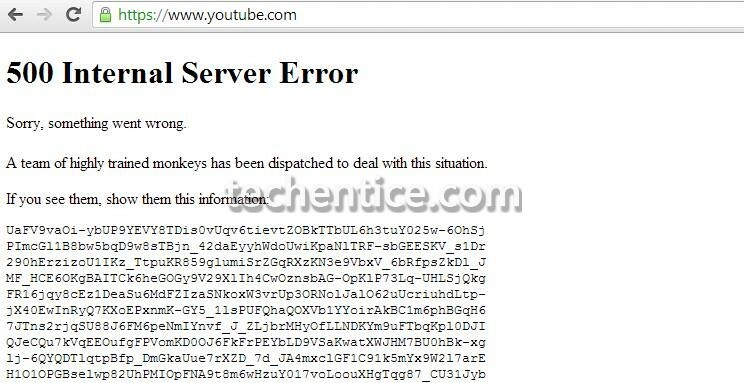 Till now there is no confirmation if it is hackers having fun with YouTube or YouTube really faced the 500 Internal Server Error. Some users reported even before 3-4 months they have faced the same kind of issue. The error page was quite funny. You may see the screenshot below. Same here. When I logged in, it gives that error. But I can log in with another account. “Anik is a Software Engineer by profession”. Really? That’s funny, since he failed to address this particular problem at all. Well, there are just four comments here and yours ain’t one of them. Unless I have missed something, so please do point out where exactly do you address this problem, “500 Internal Server Error”? Among the Google searches to resolve this particular problem, your page appears. Yet, we don’t see any resolution at all, which is even more frustrating considering that you are a Software Engineer by profession. It’s called a `False lead’. It’s ridiculous. This issue is from Google’s end, not much you or me can do from our end or user end. It’s Google’s engineers who will fix the issue. If this website goes down as a user or even if you are a web developer can you do anything from your end to fix this? No you can’t do. It’s me or our web development team who has access to fix the issue. Like that google technical team has the authority to fix this internal error.